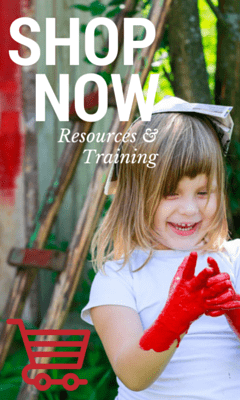 I think it is really important to ensure your outdoor play environment provides opportunities for a child to use their imagination. I love being an observer and listening to their play – children truly are masters of imaginary play and if you listen carefully you will hear them working through problems, trying to understand the world around them, exploring the roles of people and community. They are also having a whole lot of fun! 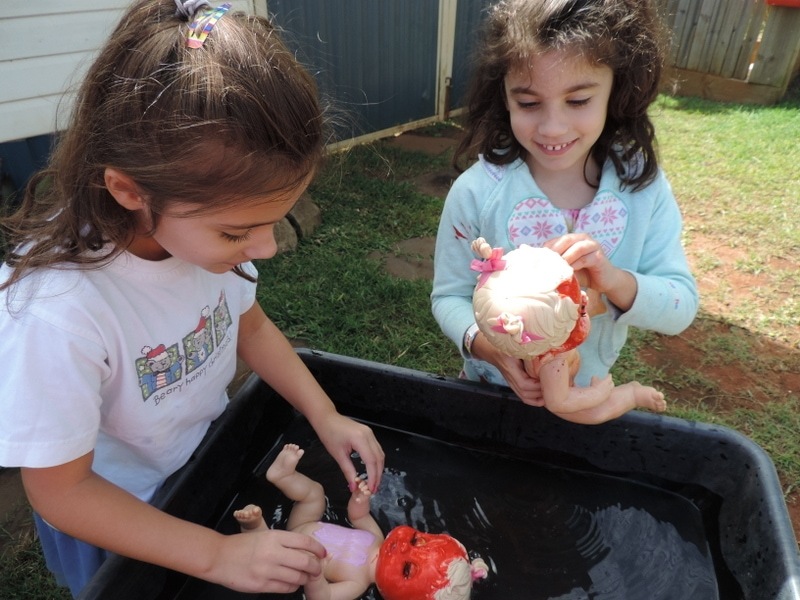 Children often use play to further explore their current interests. Although children are very adept at using the materials and environment around them to create their own play it is sometimes nice to offer an additional invitation to play with the goal of extending a current interest and acknowledging that they want to explore and create and ‘act out’ what they are learning. My twins are currently very interested in facepainting and the role of a facepainter. It seems they are always having their faces painted lately – at Bunnings, parties, markets and even when out to dinner at family friendly places. And trust me when I say they are growing quite particular with their requests! They have become little facepainting connoisseurs! I’ve let them paint my face, I’ve painted theirs and they have even tried to makeover the dog who ran far and fast when they headed toward him with the brush! But I wanted to set up an activity that would allow them to really get creative and explore this role and their emerging interest on their own. And that’s when I decided to get the dolls out! This activity was very simple to set up and even though my girls are 5 in these photos it would be suitable as a toddler activity too. 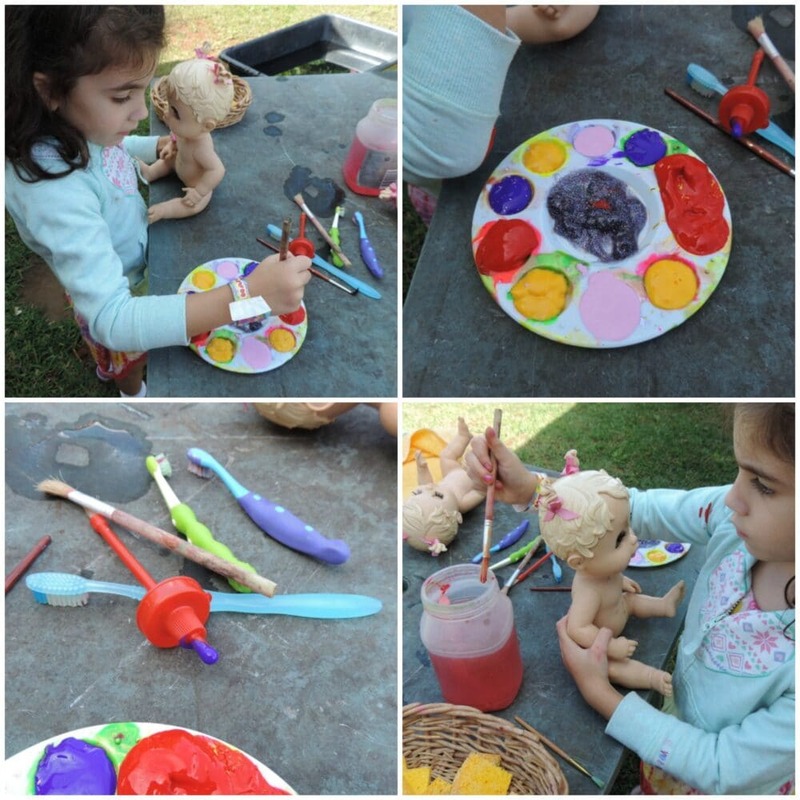 It’s one of those activities that is perfect for multi age groups as children will modify it to suit – older children will enjoy being more detailed with their painting and toddlers will just love covering as much of the doll as they can with paint! I also incorporated a water tub for washing baby and this is easily modified for all ages. Brushes – I supplied an assortment of brush ‘tools’ as you can see in the photo below but whatever you have will work. Thinner brushes allow more chance for getting those important details ‘just right’! Water – A container of water to clean brushes as they work. I also set up a tub with water and bubbles for washing creations off ready to start again! 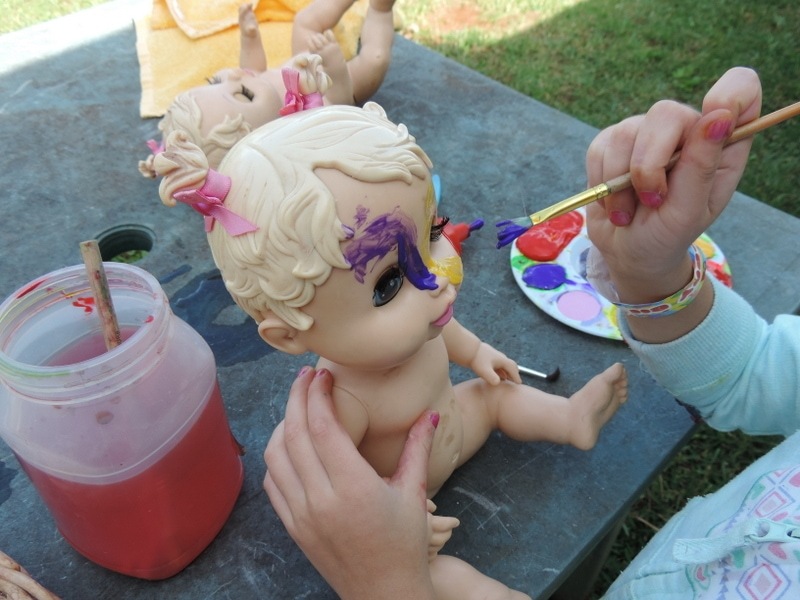 Dolls – A doll that you can prop or sit up with a larger facial area is perfect. 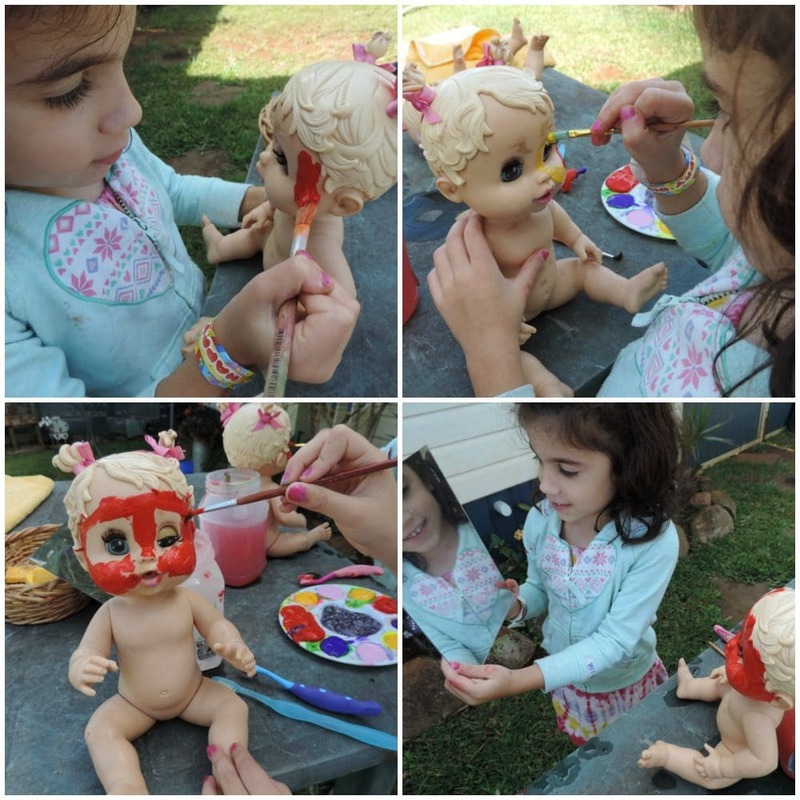 Of course face painting will quickly become body painting for many so don’t worry to much about finding the perfect doll. Just make sure you are happy for it to get messy! Extras – I cut up some kitchen sponges to use for cleaning and blending paint and then a few little mirrors so they could show their ‘customers’ the finished design. I used glitter paint in place of loose glitter but you could certainly provide something sparkly for children to stick to the face paint design! 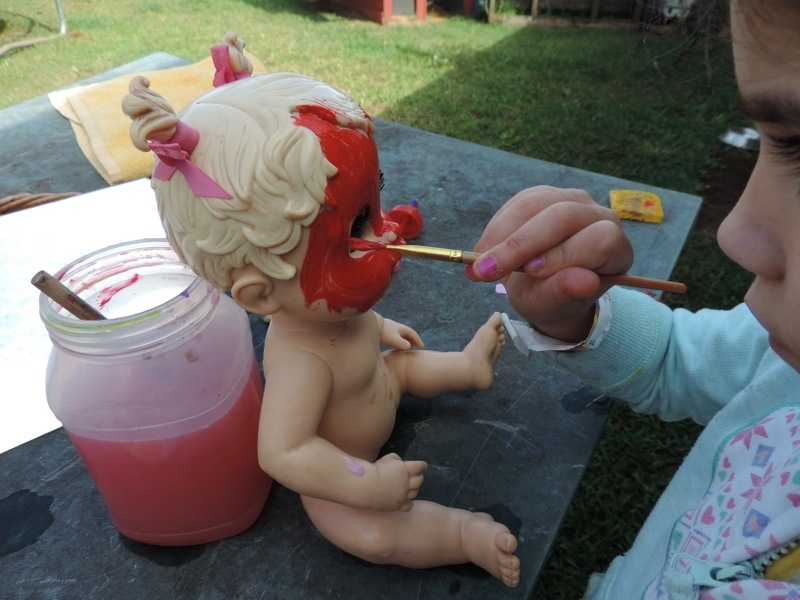 If you want to keep it simple though just stick with the paint, dolls and paint brushes! Then it’s time to step back and let the creativity and conversations begin! Ruby decided her first character was going to be ‘Spiderwoman’ and she put great emphasis on the ‘woman’ part – Love it! There was a lot of concentration and attention to detail. 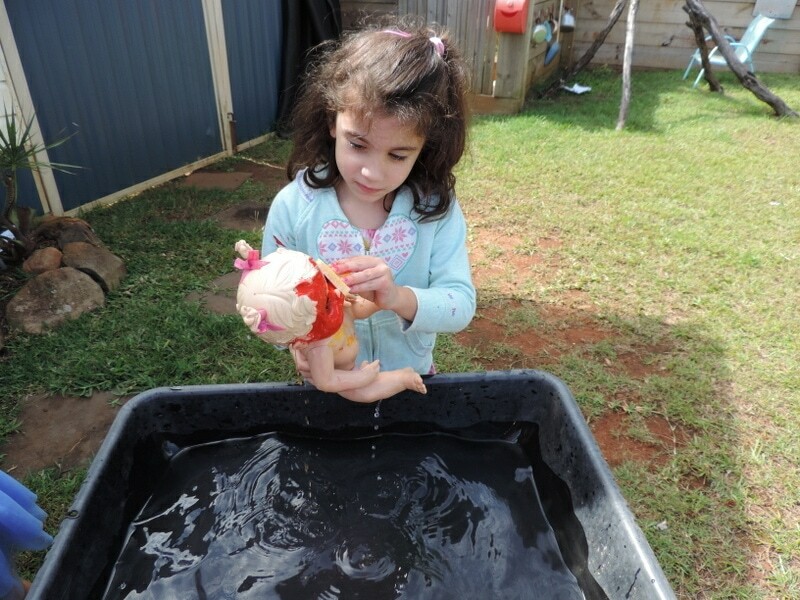 Fantastic opportunity to strengthen fine motor muscles and grip which she often struggles with. I noticed lots of experimentation with thick and thin brushes as different designs were created – there was even a little blending with sponges – just like the real facepainters! 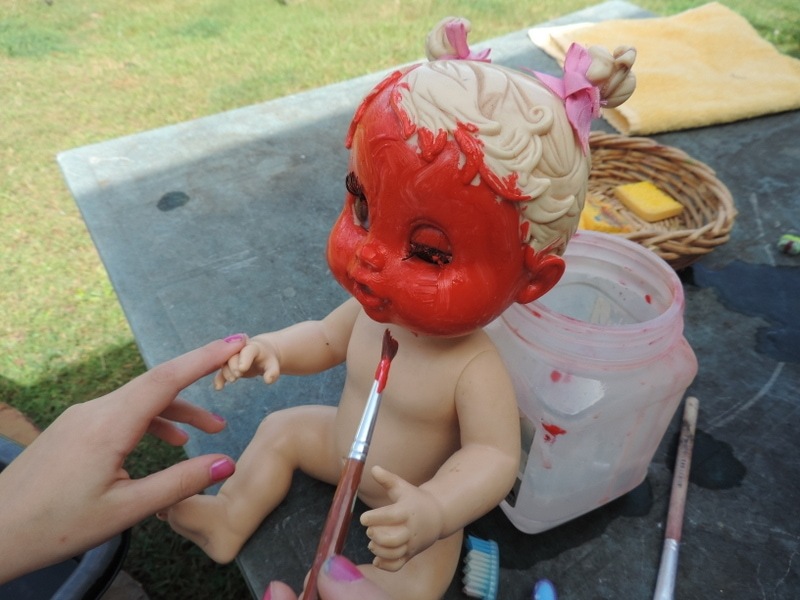 If you could have heard the conversation and explanation behind this red face you would know that there was actually a great deal of thought that went into this design even though to our adult eyes it just looks like red paint everywhere! 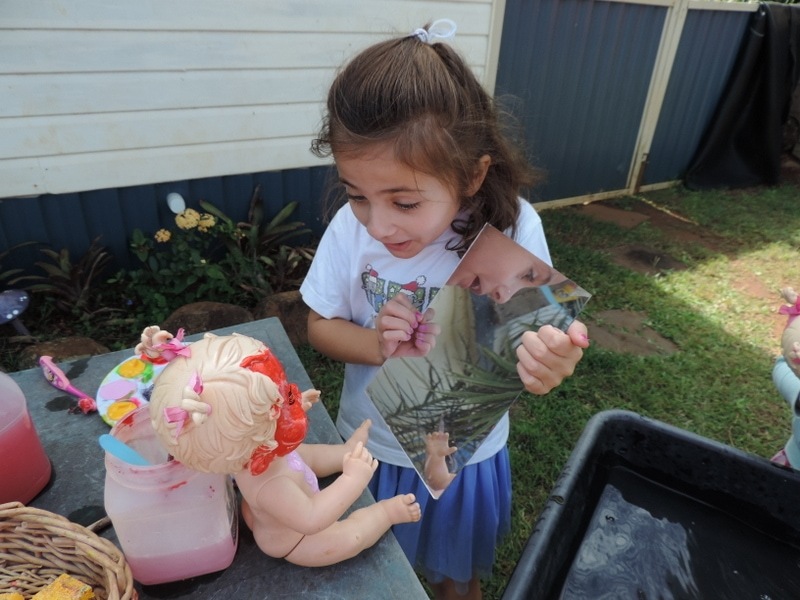 Incorporating mirrors into play provides opportunities to explore self, faces, materials and the environment from different angles and perspectives. And they really sounded like facepainters too as they asked their customers to look at their finished designs! 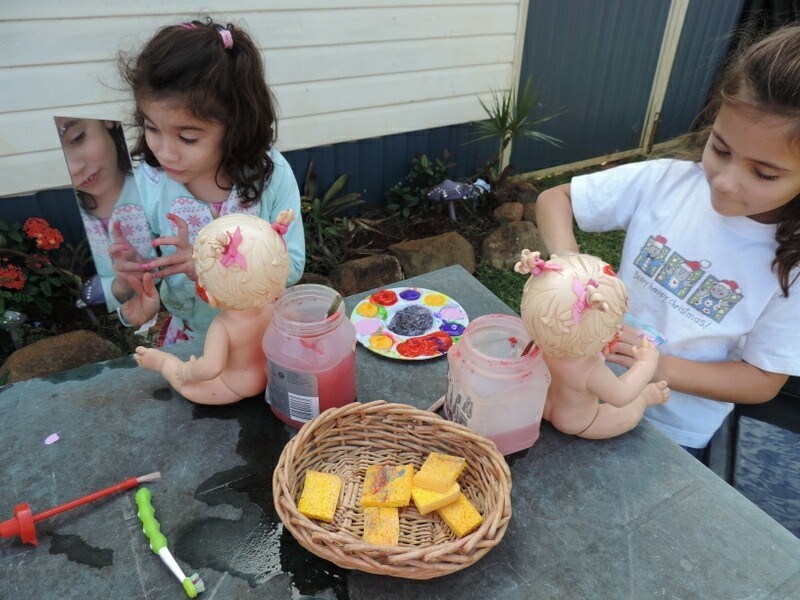 When it was time for a new design they headed over to the water tub and washed off the paint with sponges which became just as much fun and another opportunity for conversation and role play as they looked after their babies. And then it was time to start all over again! 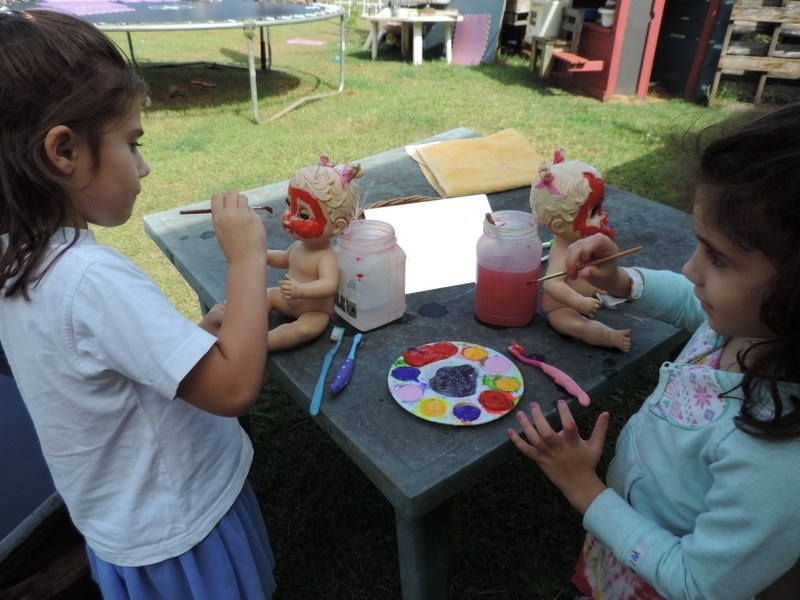 The simplest of play experiences can often invite so many opportunities for learning and creative self expression! If you give it a try be sure to share some photos in our Empowered Educator Facebook Community. I’d love to see them! Are you on Pinterest? Why not pin the image below you can save it for later. « Wooden Stump Geoboards – Taking Math Play Outdoors! Oh wow. 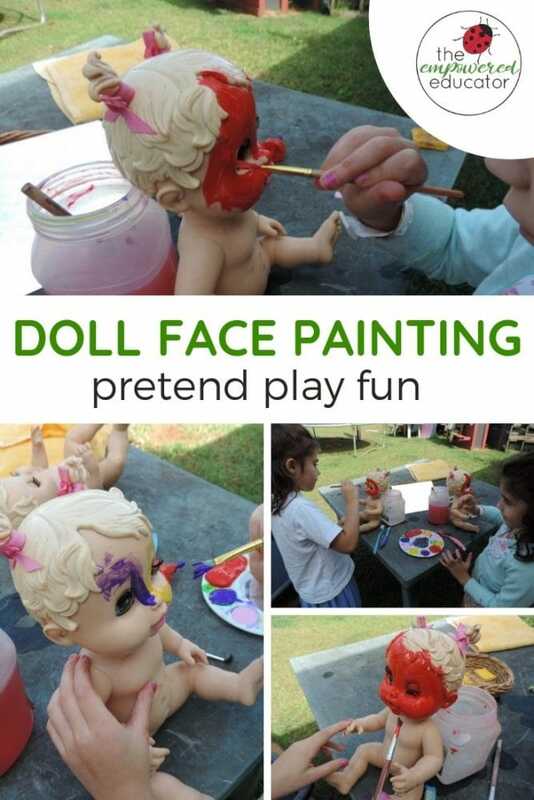 I regularly paint the children’s faces but have never thought of doing this. I’m sure they are going to be very excited to have a turn at this. Thanks again for the inspiration Jode. 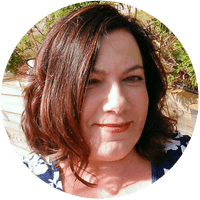 My pleasure Kay – it really was such a fun activity and we have already done it many times since I wrote this so that tells me it is a good one as children know what works! and boy do they come up with some fantastic ideas.